You may recall how I was bowled over by Michael Cox’s The Meaning of Night last year. For a Victorian sensation novel written by a contemporary writer, it was extremely accomplished, thrilling and kept me awake at night. I immediately went and searched for its sequel The Glass of Time but books kept getting in the way and it isn’t until now that I’ve finished reading it. I regret not reading it sooner when I was still immersed in the gothicky, secretive world of Evenwood and the characters attached to that great estate, because I had forgotten most of the intricate plot. But as I kept reading The Glass of Time, bits of the plot came flying back and by the end I knew EVERYTHING. As with all Victorian sensation novels in the vein of Dickens and Collins, there are layers and layers of secrets, dodgy lawyers, honest policemen and cabbies and the innocent and not-so-innocent staff. 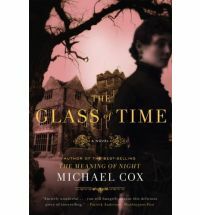 Unlike the original Victorian novels, Cox’s has been cleverly edited so that you don’t have pages and pages of descriptive prose, and the pace is incredibly fast. Thrilling indeed. The Meaning of Night was about the enmity of two men, Edward Glyver and Phoebus Rainsford Daunt, who had known each other at Eton and lived parallel lives, one charmed and the other twisted with vengeance. At the heart of their tale was the estate of Lord Tansor and his beautiful house Evenwood, a lost inheritance and the love of Emily Carteret. The Glass of Time picks up the story 20 years later with the arrival of Esperanza Gorst at Evenwood to take up the position of lady’s maid to Lady Tansor. Brought up an orphan by her parents’ friend Madame Orme and her tutor Mr. Thornhaugh, Esperanza is here to inveigle her way into Lady Tansor’s favour in order to uncover the secrets that have lain hidden these past 20 years and to right the wrong that had been done all those years ago. Who is she? And will she achieve the plans that have been set out for her? And, more importantly, will she be found out? In the process she gets to know Lady Tansors two sons, Perseus and Randolph, the unfriendly housekeeper Mrs. Battersby and two lawyers, Mr. Montagu Wraxall and the very sinister Mr. Armitage Vyse. What can I say but to urge you to read both of these books. And in quick succession too. Don’t do what I did and leave too much time in between. I want to write more of the plot but I don’t want to give any secrets away. Suffice it to say that Cox is a brilliant writer whose prose is vivid and sumptuous and just what you need when you want to sink into a good, meaty tale. There are twists and turns, secret letters and hidden drawers, and lots and lots of guilt. And of course a love story. Because in the end, all stories are about love. Sink into a good meaty tale? Sold! Do I need to read the first one first or is this OK as a stand alone? I know I have one of them on my shelves at home but can’t remember which one. You need to read the first one as it relates a lot to what happened before. But you should read both anyway! Glad to hear you enjoyed this sequel so much. The books sound really interesting. I read both of these books and the only thing sad is that the author has died and I can not wait anymore for new books from him.. such a shame..such good books! I know. It’s very sad indeed. Such a lovely writer. I have read, and loved, both books and all I can add is that I agree with you completely. I read these in quick succession right when the Glass of Time was published, and I whole-heartedly agree. Some of the best Victoriana I’ve read–and such a shame that he died before he could write a third book. Wow, this looks right up my alley…how did I miss it?! Thanks for your comments:) Makes me happy that so many people loved Cox’s books and also that many of you are interested in reading them because they are great! i LOVED the meaning of night. it was so, so good. i read it a year or so ago and keep meaning to read glass of time, but haven’t managed to yet. i’ve planned on getting to it by the end of next year, and your review had made me determined to make sure that happens! I actually wanted to re-read the first one again too, but alas, I have too many books to read at the moment.